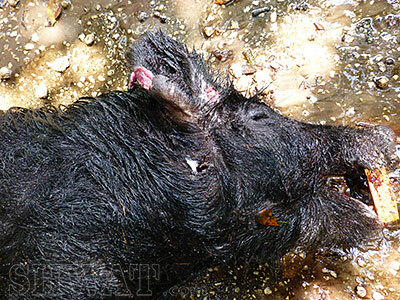 Does the .223 caliber have enough mass and punching power to effectively kill a wild boar? This question has been debated for years. Countless hunting articles have been published imploring hunters to switch to a bigger hunting caliber. It’s been said that the hog’s thick skin and internal armor require a 30 caliber bullet or better. Do you agree? For those who do, please open your mind for what you are about to read. Bullet technology has come a long way over the years and I’m going to prove to all the haters that the right .223 hunting cartridge can do the job efficiently, effectively and with only one shot. My proof comes from Allegiance Ammunition’s newest creation, its 70g PowerStrike. And one wild hog! Allegiance Ammunition has been developing powder metal projectiles since 1996. Jeff Mullins, the company founder, opened the ammunition manufacturing business in 2000 under the name Extreme Shock USA. The name was later changed to Allegiance Ammunition in 2011. Since its inception, Allegiance has strived to set the bar for high performance powder metal technology. I was introduced to Extreme Shock USA in 2010 by my tactical firearm instructors. As a result, the Extreme Shock USA 55g .223 Power Strike became my primary AR platform hog hunting ammo. Over the years, my AR platform has grown to include the 6.8 SPC, 450 Bushmaster and 300BLK. Each build has its purpose and the 5.56/.223 still remains one of my favorite close quarters hog hunting rifles. Over the past several months, Jeff has been working hard at developing the perfect wild boar hunting cartridge. We shared ideas and discussed the minimum muzzle velocity and ft/lb energy required to provide the hog hunter an effective round with devastating results. I must admit, I was skeptical at first, but Jeff worked the numbers like a mad scientist in his lab and produced the Allegiance Ammunition 70g PowerStrike. The newly designed hunting round has a muzzle velocity of 2,575 fps, 886 ft-lb of energy at 50 yards and 759 ft-lb of energy at 100 yards. In order for this newly developed cartridge to be successful, it must be able to penetrate light barriers (bone) to reach vital organs and expand or fragment when it strikes fluid filled tissue without exiting. Furthermore, most game animal are soft targets and contain more than 75% fluid. The Allegiance bullets use compressed, lead free powdered-metal which provide plenty of punching power to penetrate through thick hide and bone. Once the round penetrates the soft tissue, the powdered-core fragments, producing a controlled penetration. As the core expands into the soft tissue, 100% of the energy is transferred into the animal. Jeff calls this the “High Energy Transfer”. The expanding powdered particles pick up the surrounding damaged tissue and push it forward, increasing the frontal shock wave of the bullet. As a result, thousands of wound channels are created producing a hydrostatic shock that instantly shuts down the nervous system. I received 200 rounds of Allegiance’s 70g PowerStrike ammunition for field testing. My rifle of choice for the upcoming hunt was my Spikes Tactical AR Carbine in 5.56/.223 with a 1:7 twist topped with a 4X Trijicon ACOG. The rifle was suppressed with a SilencerCo Saker 762. Given the bullet’s ballistics and the anticipated close quarters hog hunt, I decided to zero the rifle at 50 yards. On paper, the round provided consistent half inch groups at 50 yards and groups within 2 inches at 100 yards. I feel confident that the 100 yard group would have been tighter with the use of a gun rest and a higher magnification optic. I was only using my range bag as a rest at the time. The day was finally here for the real test. 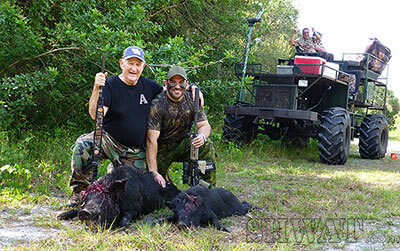 It was now mid April and my wild boar hunting group revisited Chappy’s Outfitters in Moore Haven, FL. The South Florida heat was changing hog movement and our best chance to see a hog would be at first light and just before dark. As expected, no hogs were sighted during the early morning. I walked the numerous trails surrounding the oak hammocks and saw palmettos for just over two hours and I didn’t hear or see anything except for some birds and squirrels. The hogs tend to go nocturnal and find an isolated and heavily covered area to rest during the day. That being said, unless you’re hunting at night, hog dogs are your only real solution for morning hunts. It was 9:30AM or so when the group was picked up from their stands and we set out on the buggy. Dean and Jesse Pope were our guides for the day. They’ve been hunting hogs for more than 25 years and are one of the nicest couples I’ve ever met. The weather was great, partly cloudy with the temperature expected to be in the high 80s or low 90s. Dean drove the buggy as Jesse tracked the dogs on her GPS. The dogs searched for some time and it was obvious the elusive hogs were bedded down in the thickest areas of the property. After an hour or so we moved to a separate area and gave the dogs a rest. A short time later, the dogs found what we’ve been looking for, a good sized black boar. The buggy came to a stop and Dean jumped out first. The first hunter of the day was my father. He climbed down from the buggy and I followed close behind. The dog had bayed the boar in the corner of two fence lines, but the grass was high which made it difficult to see either animal. We all approached cautiously. My dad fired a shot from his shotgun, but apparently missed. The hog bolted through the high grass and out of sight. It wasn’t long before the dogs picked up its sent. Just minutes after walking back to the buggy the other dog started barking. It must be the same hog! We quickly followed the barking and grunting into an area which didn’t provide much mobility. It was littered with fallen tree limbs, cabbage palms and non-native vines/weeds. After a few minutes of ducking, weaving and crawling we located the boar. It wasn’t the same one, it was much bigger! It grunted and snorted as it fought off the hog dog. We waited patiently for a clean shot and my father’s shotgun dropped it to the ground with a great head shot. It was a quick celebration as we walked back toward the buggy. Dean and Jesse were dragging the large black boar behind us. Then suddenly, we heard more barking just 50 yards away. Another hog? The other hunters were still on the buggy, so without hesitation I grabbed my rifle off the buggy’s rifle rack and followed Dean into the thick brush. More ducking and weaving was needed to navigate ourselves toward the barking. No standing room here, there was just enough room to take a shot from a kneeling position. It was amazing to see the dog at work. It distracted the black boar as we flanked it on its left side. Once we got closer, we realized it was the same hog my dad had missed earlier. The hog was no more than 15 yards away and it had no idea Dean and I were there. I quickly aimed for the head and just below the ear. Due to the close proximity I also adjusted my aim slightly to compensate for the bullet rise. At that very same moment Dean gave me the all clear and I pulled the trigger. The 70g bullet made little sound as it exited the suppressed rifle barrel. The SilencerCo suppressor worked flawlessly. The bullet struck the boar just below the left ear and behind the jaw. The boar toppled over on his right side without a sound. Dean and I quickly moved forward in the event an additional shot was necessary. The one shot hit its mark. The bullet severed the spine, major artery and the hydrostatic shock damaged the internal skull cavity. This was observed by the trauma to the left eye. An exit wound was found on the other side of the hog’s head which represents the exit of material due to the push created by the hydrostatic shock’s energy. The day got hotter and the hogs were difficult to find, but Dean and Jesse kept at it. They rotated the dogs frequently to keep them hydrated and rested. The remaining hunters were eager to get their turn. By 2PM the dogs had bayed up four additional hogs. It was a challenging hunt with plenty of barking, squealing, grunting and running. It was a great day and the first time boar hunters all ended the day with a smiles on their faces and meat in their coolers. In the end, my objective was to test the effectiveness of Allegiance Ammunition’s 70g PowerStrike cartridge. Clearly, it did its job. Jeff’s countless hours in his mad scientist role work provided a .223 caliber hog hunting alternative that I’m excited about. The trauma observed in the ballistic gel testing was confirmed in the field. 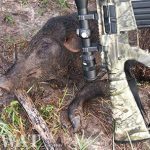 Did my story open your eyes to a different way of seeing the .223 cartridge for close quarters hog hunting? It did for me! If you would like to give Allegiance Ammunition a try for your next hunt, please reach out to Jeff directly and tell him Erik from SHWAT™ sent you. You can purchase directly from Allegiance’s website, http://www.allegianceammunition.com. 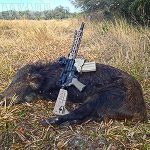 This entry was posted in The Tactically Trained Hunter - Erik Alexander and tagged .223, Allegiance Ammunition, Florida, Hog, Hunt, Is 223 enough, PowerStrike by Erik Alexander. Bookmark the permalink. Enjoyed the article. Congratulations on your hunt.